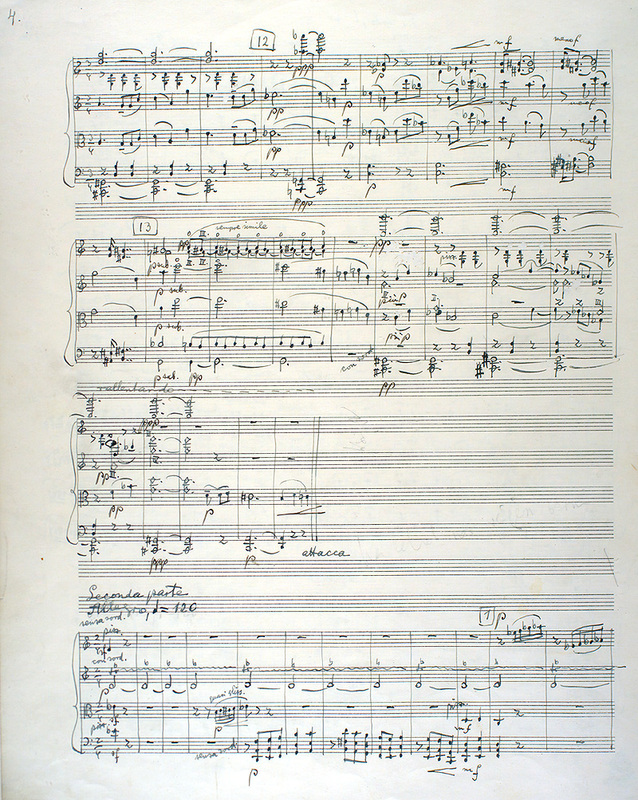 "I have always felt a peculiar frisson upon seeing for the first time the actual handwriting of a master composer, alive with its irregularities, its visible impulses, its detectable moments of ease and worry, of joy and despair... No printed score can offer such insights." -- This is from the Introduction to the Harvard University Press edition of the facsimile of the handwritten score of Brahms' Violin Concerto, the original manuscript of which is at The Library of Congress in Washington, DC. The Introduction was by the late violinist and conductor Yehudi Menuhin, whose own teacher, Georges Enesco, had played under the baton of Brahms himself. 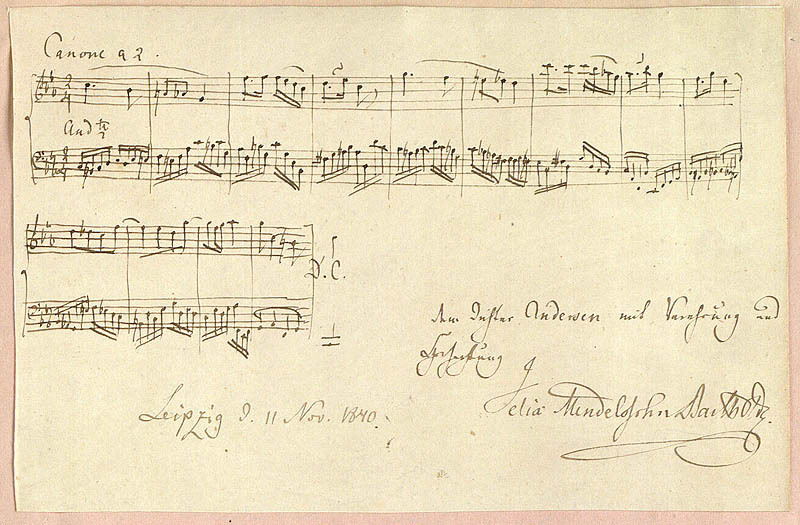 The different musical handwritings found in the autograph manuscript clearly record the creative collaboration between the composer and his friend, violinist Joseph Joachim, to whom the concerto was dedicated. It was Joachim who gave the first performance (in Leipzig, with Brahms conducting the Leipzig Gewandhaus Orchestra) soon after its completion in 1879. Joachim's own musical recommendations for solo instrumental changes are written in red ink, and are found in numerous passages in Brahms' manuscript. A composer's own manuscript -- the autograph score -- can eventually bear handwritten notations of others involved in its preparation for printing: copyist, engraver, and instrumental collaborator can all be represented in such a handwritten score. A "holograph" manuscript differs in that such scores are entirely in the composer's notehand. Like most of us, Brahms was a creature of habit. Born in 1833, he learned his penmanship with quills, and he continued using them well into the 1890s, even after they were already long out of fashion. By the time he died at 64, quills had already been supplanted by the straight pen years before. The visible variances in notation in Brahms' Violin Concerto manuscript, aside from the clearly different note hands, make it likely that Joachim used a steel pen for his own score markings. Just as machines don't have human resilience, steel or even gold pen points didn't have the flexibility of the quill, which came from living organisms, while points for the straight pens were manufactured. Some of the "blue chip" composers wrote their music with the quill, while those who came later usually used the straight pen. As times changed, so did writing instruments of choice, as did letterhand itself, and even within the same country: a comparison between Bach's ornate Baroque handwriting and Felix Mendelssohn's Romantic notehand will attest to this. 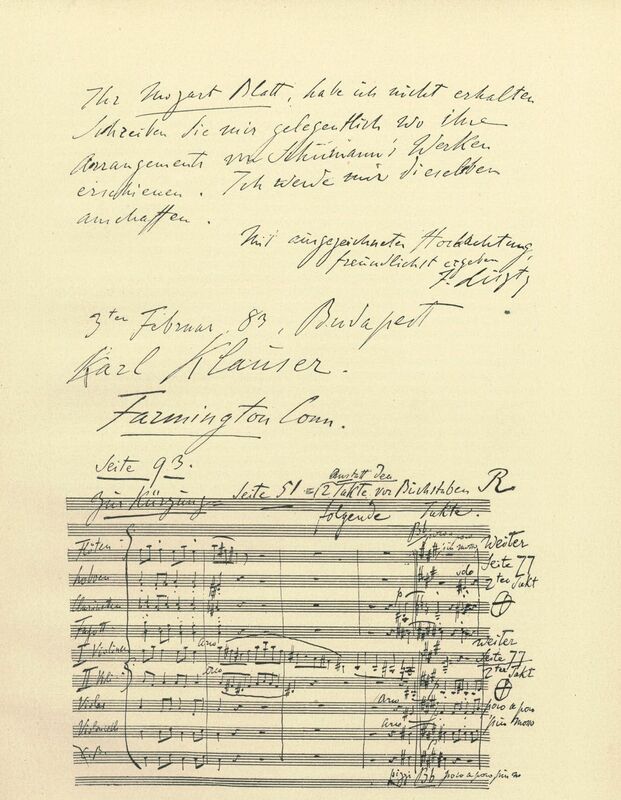 Richard Wagner, who died in 1883 (the year of the appearance of the fountain pen by Louis Waterman), used an American gold pen, a gift, to write out the entire fair copy of the score of his opera Die Meistersinger. The black fountain pen with which Gustav Mahler wrote out the fair copy of his Eighth Symphony ("Symphony of a Thousand") was displayed several years ago, along with other personal memorabilia and the manuscripts of every one of his symphonies, as part of a special Mahler exhibit at Carnegie Hall's Rose Museum. Also on view was the baton he had used to conduct what turned out to be his last concert with the New York Philharmonic on Tuesday, February 21, 1911. An examination of the autograph score of Brahms' Fourth Symphony in E-minor, composed in Mürzzuschlag, Austria, during the summers of 1884-1885, provides not only an ideal illustration of Menuhin's last sentence quoted above, but also a special kind of revelation. Page 51 of the manuscript reveals a four-bar, two-chord introduction -- two successive bars each of an a-minor and an e-minor chord -- with which the composer at some point intended the symphony to begin. The specific positioning of these four bars, appended to the end of the page in question, indicates that this introduction was an "afterthought," but which Brahms later annulled before the symphony's publication. Had he not done so, the opening of the Fourth Symphony would today correspond to that of his Third Symphony in F-Major, which also begins with a two-chord introduction. Only an examination of the Fourth Symphony's manuscript (or the facsimile of it) will bring to light the very existence of this even tentatively-proposed introduction. Also in the manuscript, there appears in thin pencil atop page 7 the following engraver's notation: "NB. Nirgends a-2 setzen, immer doppelt streichen! Brahms hat das lieber!" (Nota Bene. Never use a-dué, always [engrave] double stems! Brahms prefers it!). This notation gives concise and eloquent testimony to the personal care with which Brahms' manuscript and individual wishes were dealt. He had an absolutely towering musical intellect and he was, after all, the dominant musical figure in Austria during the last quarter of the nineteenth century. Elsewhere in the score, abbreviations are found regularly, as Brahms made frequent use of musical shorthand (as do many composers, for expediency). Few Brahms sketches, however, have survived. He was secretive about the ways his music took shape, and he claimed that a well-heated stove was one friend that would not betray a confidence. This reasoning, sound but disappointing to the historian, musicologist and scholar, becomes clear when we consider how embarrassingly crude are some of Beethoven's own early sketches for some of his greatest works. Sometimes what's most obvious can elude our conscious perception. It may be worth noting that just as a symphony is fundamentally a sonata for orchestra, a musical score, regardless of instrumentation or ensemble size, is essentially a series of written instructions for musicians. Visually, the original musical manuscript in the composer's own notehand that we call an autograph score can assume almost a life of its own. It has more "life" than a printed or engraved edition, for reasons very obvious: it's literally a graphic picture of what the composer wrote and is therefore unsullied by editorial liberties or, usually, errors. An autograph score is usually the best source, and is always particularly useful, for establishing an authentic text of a printed edition of the work in question -- certainly as the composer intended it at the time of its completion. A composer's own changes or revisions in the autograph score can also provide insights into the compositional process, the development of a composer's style, and may even indicate how he wanted his music performed. They can also shed light on the order in which the same composer penned different works. As a document of a composer's working methods, writing habits and specific intentions, his manuscript, or a quality facsimile of it, can be invaluable. We must recognize that inquiries of ten different researchers and historians, in any field, can net twelve different findings, and that discrepancies and disagreements will exist, in and out of print, as long as people remain human. Some scholars hotly contested others' interpretation of a certain Baroque embellishment in the printed edition until, after close examination of the original manuscript itself, the "mordent" in question turned out to be nothing more than an ink smudge. A composer's autograph score as "flawless" source material is not always absolute. If "perfection" exists at all, it resides only in the composers' minds. They sometimes alter details of their works during rehearsals or in publication preparations. 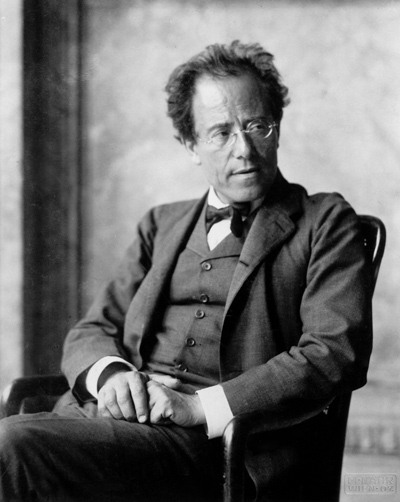 Mahler would modify his orchestrations in accordance with the ensemble circumstances of an approaching performance. Brahms, too, as above, made alterations in the score of his Fourth Symphony before its publication, and, in consultation with Joachim, also sanctioned numerous changes in the solo violin part of his own Violin Concerto after its composition in Pörtschach, Austria. Composers, being human, have a full set of human weaknesses, and they can make the same kind of mechanical errors in copying, even in their own manuscripts, that professional copyists or engravers do. 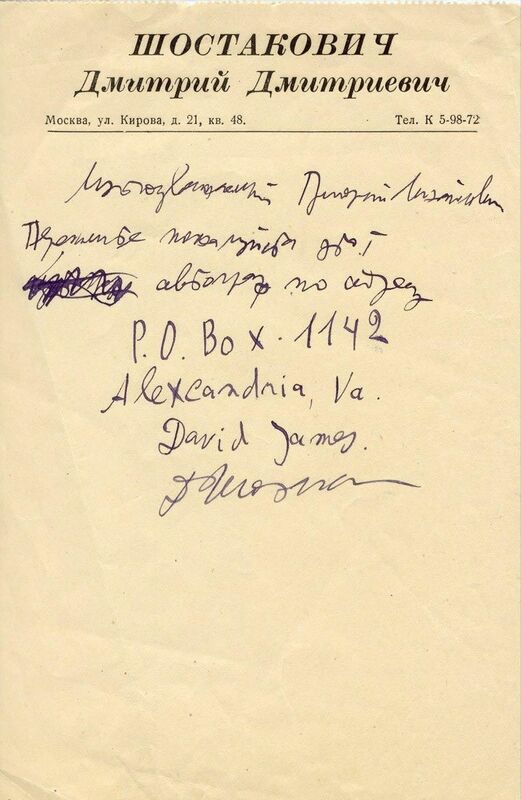 Copyist Arnold Arnstein told this author how Pulitzer Prize-winning composer Samuel Barber was beside himself with profuse apologies when he learned that he had omitted a dot from an eighth note in one of his own manuscripts. 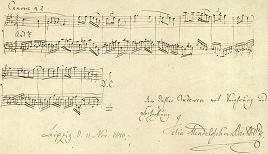 Antonín Dvořák was notoriously poor at proofreading his own scores in preparation for their engraving before publication. The responsibility for this tedious but essential task was undertaken -- voluntarily -- by his mentor and friend, Johannes Brahms. With the development of musical printing by means of movable musical type (credited to Ottaviano dei Petrucci in 1501), various entities -- royal collections, private libraries, church archives, etc. -- eventually replaced their accumulations of original manuscripts with more convenient bound printed editions. Today it may be hard to believe, but the autographs were in some cases simply discarded. Such travesties call to mind a particular important composer (a contemporary of Bach and born the same year as he, 1685). Of his considerable output, a meager three known autographs in his own hand have been preserved: one personal letter, and two music manuscripts (a motet, Pange Lingua, and a Miserere, in the Vatican Library). Although all of his roughly 600 known harpsichord pieces were long ago published by Ricordi of Milan (among others), there isn't a single autograph manuscript of a keyboard sonata by Domenico Scarlatti that is known to have survived. That he spent the last 28 years of his life in Spain producing so much music -- most of it for his patroness, Princess (later Queen) Maria Barbara -- makes the virtually total disappearance of his autographs altogether puzzling and certainly tragic. Indeed, even Madrid's Convent of the Mostenses, in which Scarlatti was buried in 1757, has itself long since vanished. Cardinal Pietro Ottoboni, an earnest music lover, hosted performances in Rome by fine musicians. In 1708 he brought together Scarlatti and Handel (who was also born in 1685), both of whom were induced to perform on the organ and on the harpsichord. The general consensus was that while Scarlatti was the finer harpsichordist, George Frederick Handel was the finer organist. 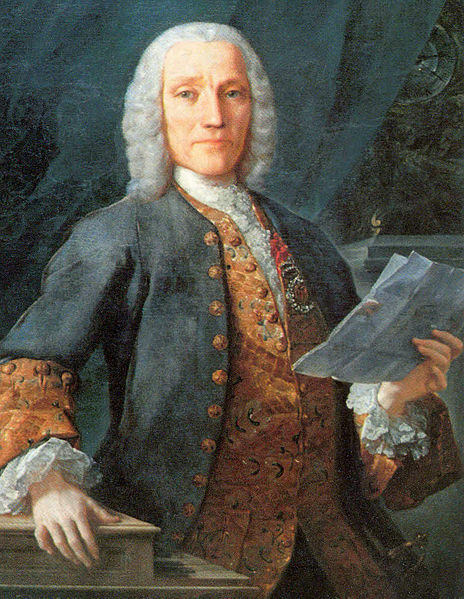 Until the end of his life, Scarlatti would make the sign of the cross whenever Handel's name was mentioned. The manuscripts of some of the later composers, too, have met with some mishaps. 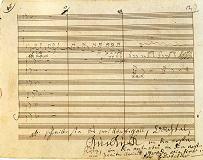 The autograph score of Brahms' First Symphony is in the Pierpont Morgan Library in New York. Dover Publications nevertheless published the facsimile without its entire first movement, which has in fact been missing for years. Its discovery would be, in a phrase, a musical and historical milestone. Several sections were lost from the autograph score of Mozart's Missa Longa in C Major, K.262. Even the manuscript of one of Beethoven's most well known pieces didn't escape an unfortunate amputation: several pages of his "Moonlight" Sonata have been missing from the original manuscript, a fact documented as long ago as the 1830s. The autograph scores of Alberic Magnard perished with the French composer in September, 1914 when, after he had sent his family to safety, advancing German military forces burned his house to the ground. (It should be noted that the action was prompted by a shot from inside the house which killed one of the soldiers). The increase in the survival and veneration of composers' handwritten manuscripts corresponds to the then-new and unprecedented early 19th-century views characterized by the Romantic era's perceptions of musical genius and historic greatness. The concept of the supreme authority of the composer, and the conviction that his word was considered definitive, were some of the notions of history that evolved during that age. Then more than today, the image of the creative mind was respected and in some cases even enhaloed, with The Composer an object of reverence, and his persona being seen as something bordering on divinity. This was the Romantic view -- "romanticized" now but quite real then. When Verdi saw the original manuscript of Beethoven's Third Symphony, the "Eroica" (now at the Gesellschaft der Musikfreunde in Vienna), he reverently removed his hat. Robert Schumann wore his heart on his musical sleeve, for all to hear. Johannes Brahms, more the introvert, concealed his emotions behind a veil, aiming his musical riches at those who sought them -- but it's said he kept on his own desk some writing-sand from the inkstand used by Schubert, whose music Brahms held in very high regard. The Romantic sentiment was fostered and given impetus during its time by the appearance of Beethoven, who more than any other composer of his day almost single-handedly changed the course of tonal history, wrenching music out of the 18th century and into the next. It may be hard for our 21st-century ears to believe, but Beethoven's "Eroica" symphony was as revolutionary in its day as was Wagner's opera "Tristan und Isolde" six decades later. Like Stravinsky a century after, Beethoven also in some way influenced nearly every important composer who followed him for the next several musical generations (Chopin being a notable exception). In this respect Mozart may have been born a generation too early, but Beethoven arrived when the time was right for it. The Age of Enlightenment was here. It was also a matter of differences in their personalities: where Mozart might have knocked vainly at the door, Beethoven figuratively kicked it down, marched right in, and defiantly made himself comfortable. And heaven help those who objected, be they paupers in poverty or princes in palaces. "Was Sie sind, sind Sie durch Zufall und Geburt. Was ich bin, bin ich durch eigene Austrengung. Es hat Prinzen vor Ihnen gegeben, und es wird sie nach Ihnen geben -- aber es gibt nur einen Beethoven." (What you are, you are through accident and birth. What I am, I am through my own efforts. There have been princes before you and there will be princes after you -- but there is only one Beethoven). Thus wrote the composer to one of his own patrons -- very determined behavior, considering that the nobleman was helping to support Beethoven financially. 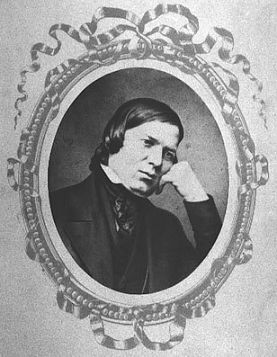 Robert Schumann is sometimes called The Romanticist with good reason. By design, he wrote the manuscript of his first symphony (subtitled "Spring") in 1841 with a steel pen-point he had found at Beethoven's original gravesite in Vienna's Währing Cemetery, which is now a public park. 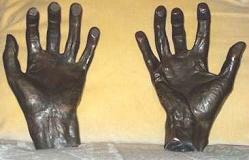 Both Beethoven and Schubert were originally buried there, nearly side by side (at Schubert's own request). Though their remains were taken in state and re-buried in Vienna's Zentral Friedhof (Central Cemetery) in 1888, the original gravestones remain on their original sites in the Währinger park. 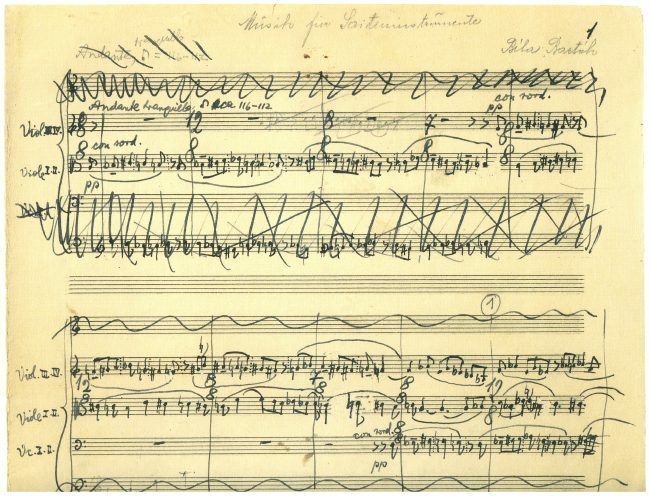 Aside from the emotional intensities and extremes that characterized not just Romanticism but also Schumann himself, the pen he used seems to have served him as a talisman and spurred him to an almost superhuman creativity in this case: he sketched the symphony in only four days and spent the following ten days orchestrating it. For his manuscripts Bach would use a rastrum, a multi-nibbed pen which rendered all five lines of the staff simultaneously. Rastra (some of which could draw several staves at once) could be used either freehand or ruled. 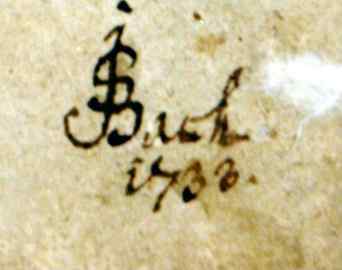 The visible waviness of a staff, however slight, and the unevenness of spacing between staves in many of his manuscripts indicates that Bach could be in some ways "unruly" (in keeping with his sometimes restless personal nature that often got him into trouble with the church, his employer). The published facsimile of the sketches for Le Sacre du Printemps (The Rite of Spring) clearly shows that even Stravinsky, nearly two centuries later, sometimes used rastra (and of different sizes), for whatever reason. 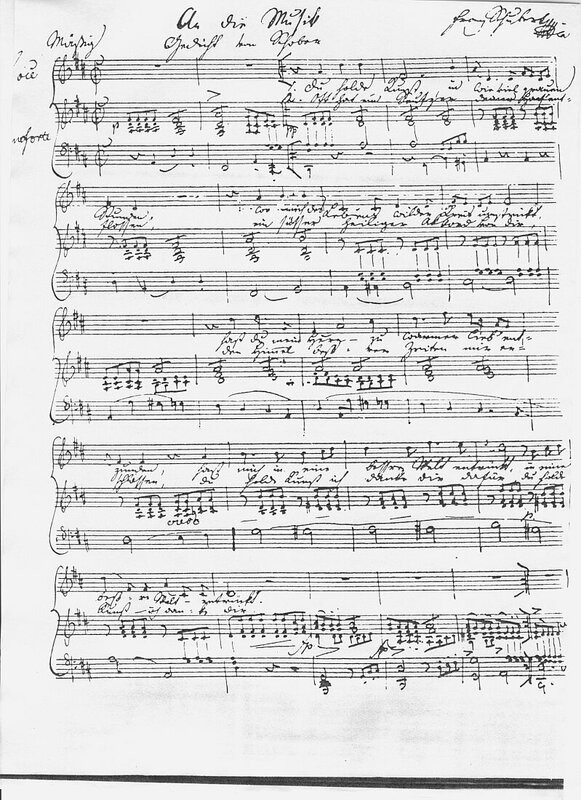 Bach's own autograph score of his St. Matthew Passion demonstrates rubrication, the use of red ink to inscribe the words sung by the vocal soloists. Though sometimes used for actual musical notation as well, using rubrics for the text per se was an older and more widespread approach. Most of Bach's original scores are in the upright format (portrait, in computer-printout parlance). 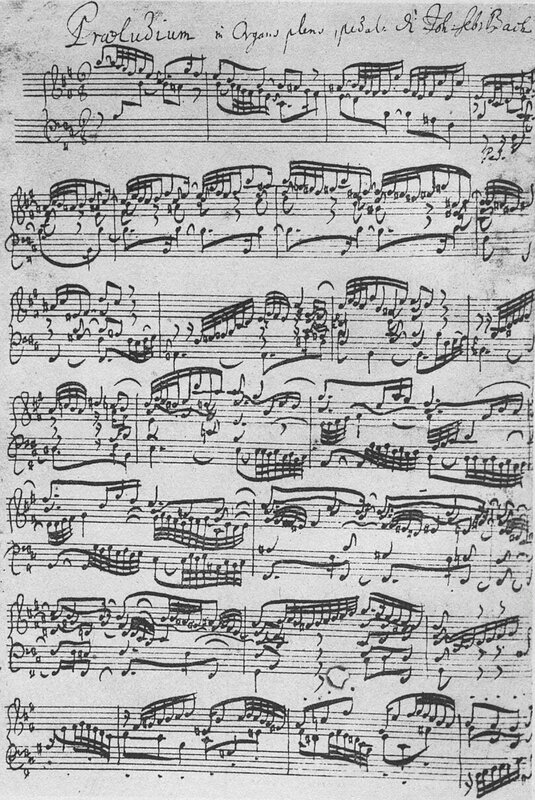 Some exceptions are the manuscripts of his Brandenburg Concerti and much of his keyboard music, written on horizontal format paper (i.e., landscape). Indeed, the printed editions of his organ works appear in this oblong configuration even today. 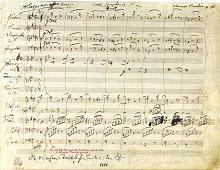 Mozart, too, consistently used oblong staff paper, for both his orchestral compositions and his piano music. It's worth noting that two of the piano sonatas he composed in Paris were notated on staff paper in the vertical configuration, commonly used in France at that time. 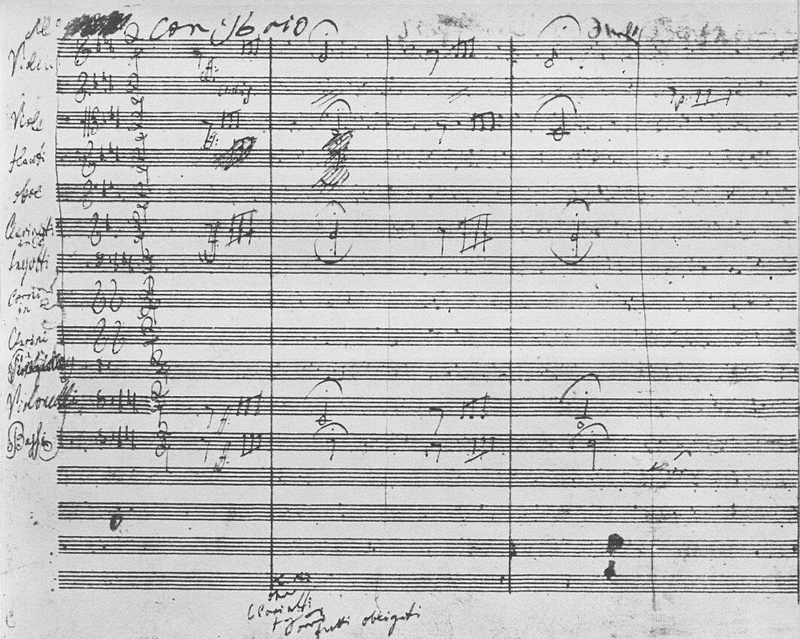 Schubert also seems to have favored the oblong format paper, on which he scored his "Unfinished" symphony in b-minor. When Bach died in 1750, he was mourned not as a composer per se but as an organist. Scholars estimate that about thirty percent of his enormous musical output was irretrievably lost after his death. Those who took and sold his manuscripts for their own weight in paper committed a theft of immeasurable proportions, and played the deplorable role of having permanently robbed posterity of treasures we can now only try to imagine. In Bach's day paper was relatively costly, and this may partly account for the economy of his musical notation, which in his large scale works is often quite dense and minimizes waste of paper and space. Some of his manuscripts (as do those of Handel) look almost like a picture of an army of ants scurrying about on the pages. 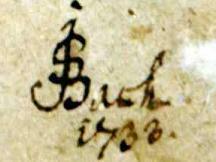 Many of Bach's manuscripts have a few extra bars crowded on to an additional staff at the bottom of a page. As an expedient he would sometimes use tablature notation, a system of musical "shorthand" (even then nearly obsolete) utilizing numbers, letters and other symbols in lieu of musical notes. Beethoven could simply run out of room for notation at the end of a staff. He would either manually extend the lines, or altogether add an extra bar or two at that point. 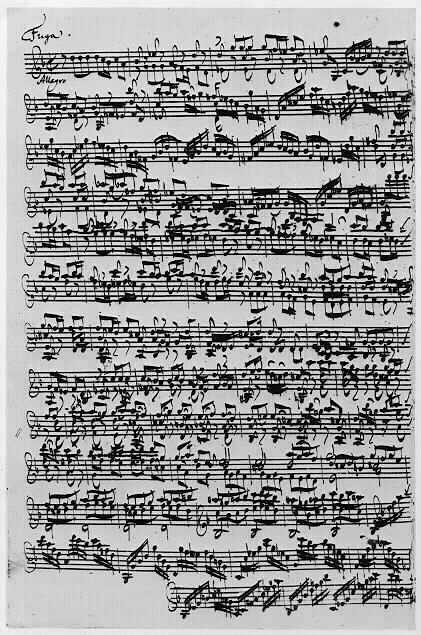 The bottom of the last staff system on the 7th page of the manuscript of his "Waldstein" sonata will illustrate this (page 4-r in the facsimile published by the Beethoven Haus, Bonn). Beethoven was arguably the most "imbalanced" composer as regards spatial relationships -- the vertical alignment -- of notes within bars of his manuscripts. The first note he'd set down in a bar might be placed almost in the middle of the measure. 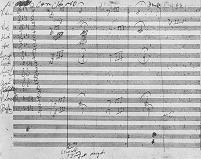 An example can be seen at the beginning of the third movement in the autograph of his Ninth Symphony. The manuscript score is massive, in keeping with the magnitude of his music. If Napoleon, like Mexican general Antonio Lopez de Santa Anna later on, hadn't surrendered to the lure of power, Beethoven's Third Symphony would today be known not as the "Eroica" (Heroic), but as the "Bonaparte" symphony. The completed score, ready to be sent to Beethoven's publishers, already had the subtitle "Bonaparte" on the title-page in the composer's own letterhand. His pupil Ferdinand Ries brought Beethoven the news that Napoleon had declared himself emperor of France. The composer, livid with fury, flew into one of his rages, exclaiming, "Is he, too, nothing more than an ordinary human being? Now he will trample on all the rights of man and indulge only his ambition. He will exalt himself above all others and become a tyrant!" 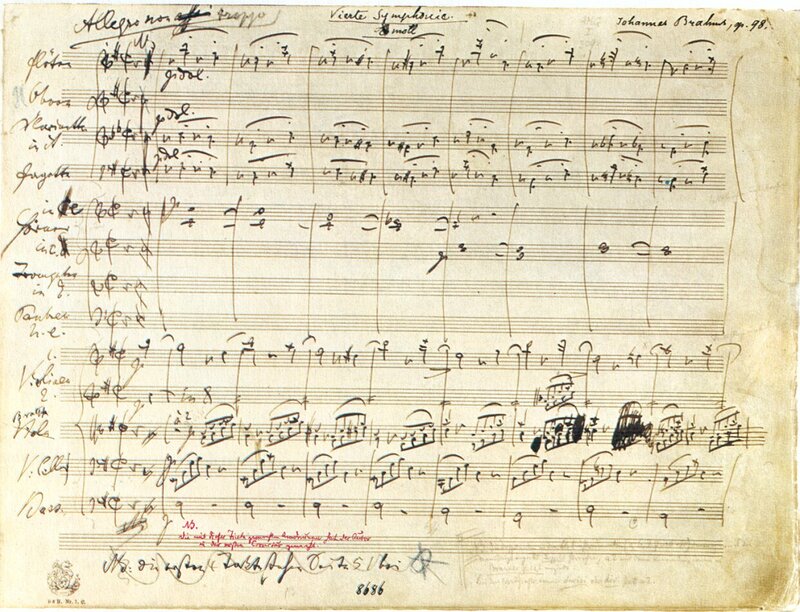 Beethoven went to the table on which his manuscript lay, and crossed out the "Bonaparte" dedication -- with such force that it actually tore a hole in the paper. 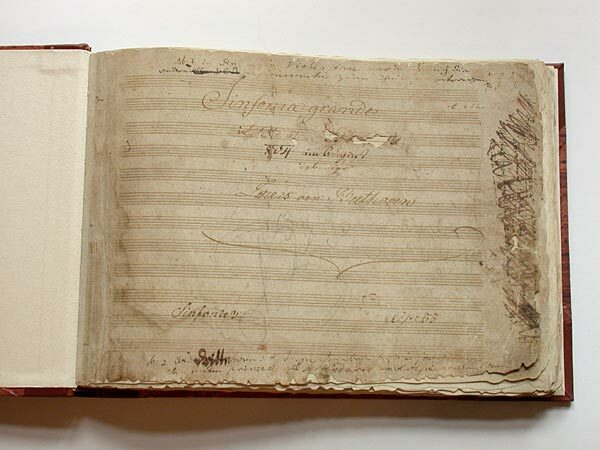 There's no-one left alive now who knew Beethoven (the last one who did, Dr. Gerhard von Breuning, died in 1892) -- but the hole the composer made on that manuscript title-page is still there. When the symphony was published in October, 1806, its dedication was not to Napoleon, but bore instead the following inscription: "Sinfonia Eroica -- composed to celebrate the memory of a great man." Considering the differences in pliability between the rigid steel pen point and the more elastic quill (even taking into account the treatments that were used to harden quill nibs), the force with which Beethoven crossed out Napoleon's name must have been considerable. 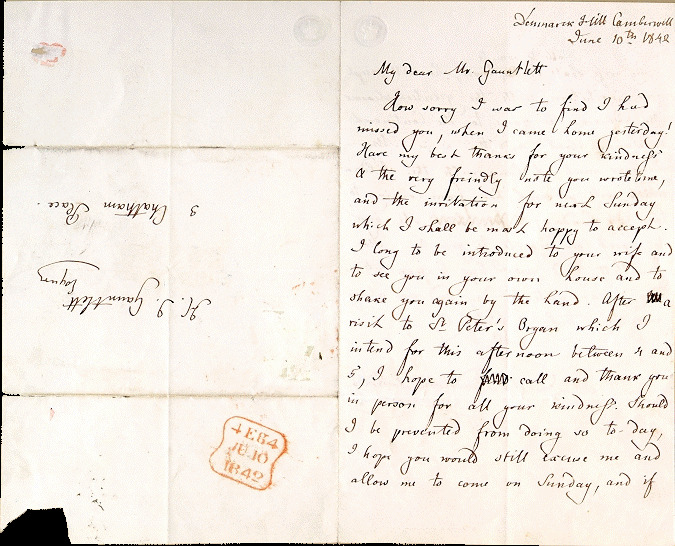 There also exists a note from Beethoven to a friend asking for "some good pens" -- meaning, of course, quills. Some composers wrote in a notehand almost clear enough to enable a musician to play the music from manuscript. Among them were Schubert, Mendelssohn, Chopin, Bartok -- and Bartok's countryman, Miklós Rózsa. Beethoven was less considerate: as he grew older, his musical and prose handwriting became wild in the extreme -- as did his music, according to the views of some of his contemporaries. It may have been a matter of practical priorities: "I have no time to paint my letters," he once said. Felix Mendelssohn's facility as a composer was matched by his skills as a painter. 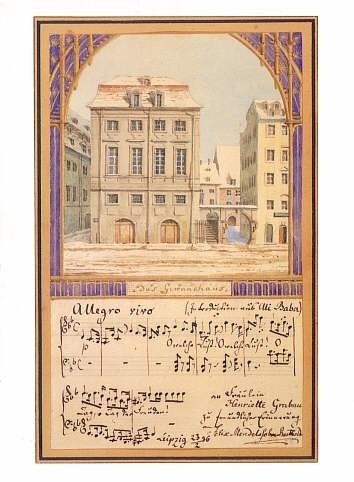 His famous watercolor of the old Gewandhaus, the principal concert hall in Leipzig, bears in his own notehand a quotation of music from "Ali Baba" by Luigi Cherubini. The inscription reads, "To Fraulein Henriette Grabau, in friendliest remembrance, Felix Mendelssohn Bartholdy, Leipzig, 23 Feb. 1836." Coincidental history shows us that Mendelssohn so personalized his painting on the very date the 13-day siege of the Alamo began in what was then the northern Mexican province of Coahuila y Tejas, in the town of San Antonio de Bexar. 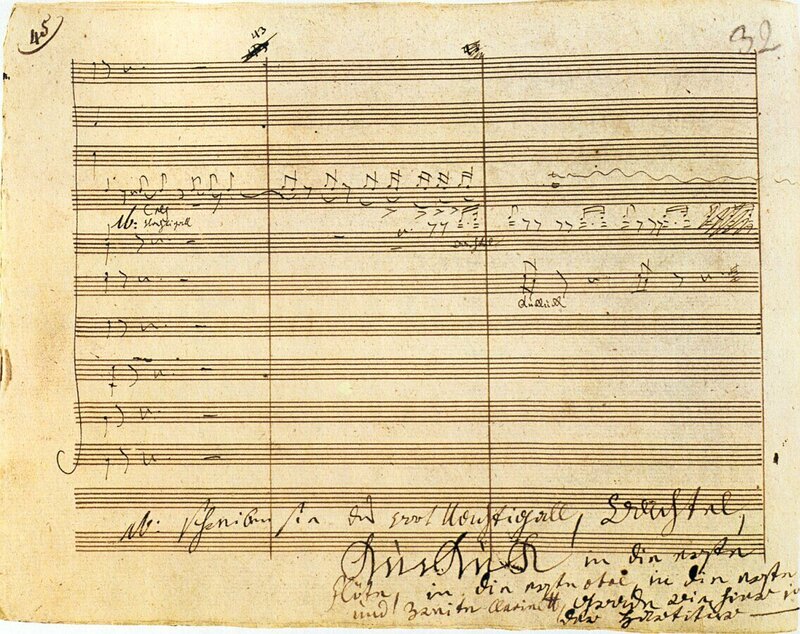 The case of Beethoven proves there need be no connection between the poverty of a composer's handwriting and the riches in his music. His copyist Ferdinand Wollanek eventually went blind, though any correlation between that misfortune and Beethoven's unfortunate handwriting should of course be conjectural. A feat performed by Beethoven's friend Marie Bigót de Morogues in 1814 seems a testimony to her abilities as a pianist: she played the composer's Appassionata sonata from the manuscript itself. Those who have seen it will know what this means. It bears water stains still today from having been transported by Beethoven, even inside a traveling trunk, in a teeming downpour. A facsimile of the manuscript was published by Edition Peters, Leipzig. The scores of Anton Bruckner were modified in ways that might be unique in the annals of music history. Some of his admittedly well-meaning but misguided disciples changed specific ensemble details, affecting some of the orchestral textures and therefore the very flavor of his symphonies. Many of these desecrations found their way into the printed editions of Bruckner's scores. The differences between the published versions and the composer's original intentions revealed in his manuscripts created discrepancies, contradictions and confusion in the various printed scores which existed well into the 20th century. Bruckner sometimes actually allowed the changes to his scores, showing a surprising and almost mortifying passivity. One man who wanted to chronicle Bruckner's life must have seen the difficulties he faced when he asked the composer about some of the major events during a certain recent year in the composer's own life. Responded Bruckner indifferently, in his regional Austrian inflection, Iss eh nix g'schegn (idiomatically, "Oh, nothing happened"). Peculiarity, it appears, is attributed to eccentricity in the wealthy (often actively encouraged), insanity in the layman or politician (often dangerously ignored), and to artistic temperament in the composer (often amusedly tolerated). 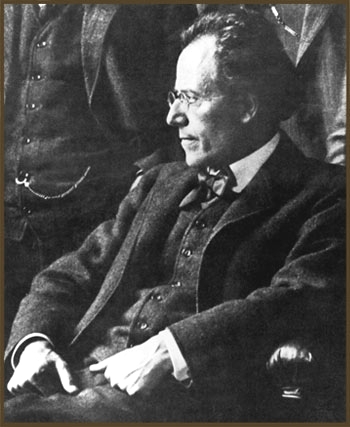 Though officially not a student of Bruckner, Gustav Mahler saw the older man as a mentor, which effectively qualifies Mahler as a disciple. After the disappointing premiére of Bruckner's Third Symphony in 1877, the 17-year-old Vienna Conservatory student Mahler soon made a 4-hand piano arrangement of Bruckner's symphony and presented it to the older composer. The printed edition was the first published piece on which Mahler's name appeared. Some sources say the transcription was done by Mahler in collaboration with fellow student Rudolf Krzyzanowski, but his name doesn't appear on the title page of the published score. Modést Mussorgsky compensated in musical imagination and originality for what he may have lacked as a "polished" composer of "refined" music. His manuscripts are clearly written in a visually beautiful and calligraphic manner. His most popular work, "Pictures At An Exhibition," seems aptly named. Even without Rimsky-Korsakov's intervention, Mussorgsky was still light years ahead of Steven Foster, the manuscripts of whose tuneful songs reveal stems on the wrong side of the note heads and flags on the wrong side of the stems. The similarities in harmonic relationship between passages in Stravinsky's ballet "Petrouchka" and the opening of the Coronation Scene from Mussorgsky's opera "Boris Godunov" may be more than just coincidental. Both composers made use of a dramatic harmonic relationship based on a tritone. By definition three whole tones, the tritone is the musical interval that bisects the entire tonal range of a scale, since it lies exactly midway between its extremes. Two chords (successive in the Mussorgsky piece, simultaneous in the Stravinsky) whose root positions are a tritone away from each other therefore couldn't be more distant, harmonically. Depending upon the skill with which it is handled, this harmonic distance can produce a handsomely arresting chord change (as in "Boris Godunov") or a strident but striking polytonal harmony in itself (as in "Petrouchka"). Additionally, this dramatic tritone relationship corresponds markedly to the well-known harmony known as the Neapolitan Sixth, a spectacular example of which can be found at a quite unexpected moment in the last movement of Beethoven's "Eroica." The tritone chord change found its way into the music of Rachmaninoff, as well, and it also became a feature of the harmonic shifts used by Bernard Herrmann in his film scores, giving them a pointedly dramatic emphasis. Chutzpah (with a soft "ch") is a Yiddish word meaning, roughly, nerve, or gall, in the sense of audacity. (Illustration: a boy murders his parents and then pleads for leniency on the grounds that he's an orphan). Dmitri Shostakovich had this attribute, but musically manifested. Many, perhaps most, composers, being fully aware they're as fallible as anyone else, would use pencil when sketching or writing a draft of their compositions -- just as the prudent person uses a pencil, not a pen, for crossword puzzles. Not so, Shostakovich. One of the most important symphonists of the 20th century, he had enough confidence, certainly in his compositional technique, to compose much of his music with a fountain pen. (Whether he used it also for the Pravda crossword puzzle is not known...). To say that Rossini had a genuine penchant for comfort would be an understatement. He was also rather corpulent and was in the habit of composing in bed. If a page of manuscript paper dropped to the floor he'd simply re-write it rather than physically retrieve the errant sheet. Rossini wrote very little later in life (and Sibelius wrote nothing after the late 1920s). Notoriously lazy, Rossini unashamedly proclaimed, "I have a passion for idleness." 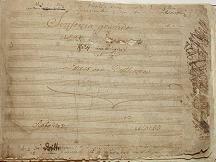 Schubert, who apparently never owned his own piano, seems to have left us numerous manuscripts but fewer letters. There's a tendency today in some quarters to focus on an artist's sexual leanings. Much has been made of Tchaikovsky's. Sometimes silence can be more revealing than detailed attempts at explanation. Just as there isn't one known letter by James Bowie in which he even mentions a knife, there are no known letters by Franz Schubert that were written to a woman. Sight reading -- playing a piece of music prima vista, without ever having seen or studied it -- is almost an art in itself and not every musician, even a good one, has facility at it. It can be difficult enough to sight read even from a printed piano score routinely having only two staves per system. Orchestral score reading, however -- that is, playing on the piano from an orchestral score, in manuscript or even a printed edition -- can compound the difficulties in as many ways as there are transposing instruments called for in the score. If not actually "equivalent," it's in some ways comparable to reading twenty or more lines of text, many in a different language, many of those a distinct "dialect" saying something related though different, and then "translating" the lot simultaneously into cohesive and intelligible statements. Even for the chief interpreter at the United Nations this might be something of a challenge. There's no question of Shakespeare's insight when we consider Sonnet XXIII: "O, learn to read what silent love hath writ! To hear with eyes belongs to love's fine wit." A professional musician can "hear" the music by reading the score. The reputations of Mozart, Franz Liszt, Camille Saint-Saëns, Georges Bizet and Leonard Bernstein as orchestral score readers are now legend. 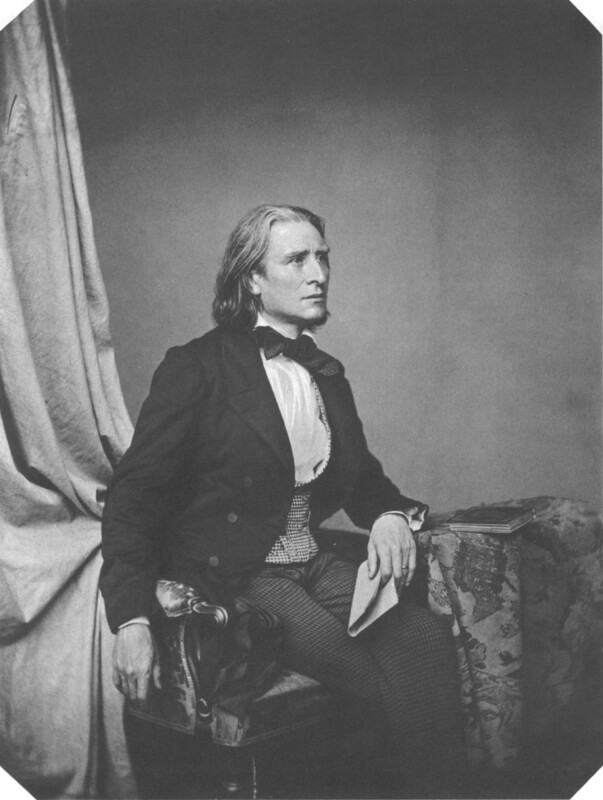 It's a matter of record that Liszt could sight read anything, and it's said that musicians who watched him do so would leave his residence talking not among themselves but actually to themselves. The author had the experience of witnessing Bernstein play on the piano, effortlessly and sight-unseen, page after page from the orchestral score of an early 20th-century symphony. "... Transposition and score reading .... involve being able to make instant sense at the piano of the wind, brass and string parts in an orchestra, employing up to half a dozen different clefs ... Orchestral score reading is a skill that differentiates professionals from talented amateur musicians. A conductor has to know, for example, that French horns come in many different keys; that violas generally play in the alto clef; that the English horn sounds a fifth lower than it is written; that the tenor clef is used by bassoons and tenor trombones in their high register to save the copyist having to employ too many ledger lines. Once a student has mastered the conventions of the printed musical page, he must develop the ability to decode the various keys and staves instantly, to open a full orchestral score with individual staff lines representing maybe twenty separate instruments and translate the score into the fingers of two hands spread over the keyboard, an act of instant comprehension that tests and stretches the brain like little else in music." Thus wrote Humphrey Burton in his biography, "Leonard Bernstein," and his description of orchestral score reading seems to illustrate that skill like little else in literature. 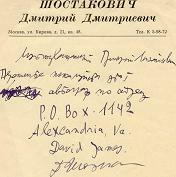 Some publishing houses, Universal Edition among them, have produced editions of music by many 20th-century composers that consist of a reproduction of the composer's autograph manuscript. They can be, in a word, a joy not only for a musician but also for a calligrapher to examine. Those who have seen Ben-Hur, El Cid, King of Kings, and Spellbound may recognize the name Miklós Rózsa (April 18, 1907 -- July 27, 1995) as the composer of the music for those films. The orchestral score of Dr. Rózsa's Concerto for Viola & Orchestra, published by Breitkopf & Härtel of Wiesbaden, Germany, is a photographic copy in the composer's own notehand. So, too, is the score of Stanley Wolfe's Third Symphony published by Boosey & Hawkes, who claimed that the format for the Wolfe work was the largest one used since the publication of Aaron Copland's Third Symphony. Liszt and Saint-Saëns were voluminous letter writers, and their missives are somewhat more readily available and affordable than others'. 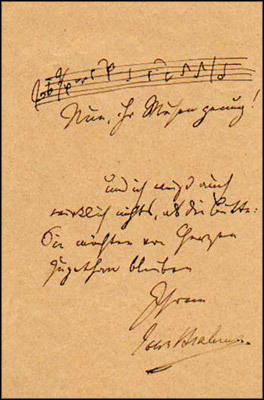 Anything containing Beethoven's handwriting, even if only his signature, can command a small fortune, and just a short, mundane prose note from a composer increases dramatically in value (and price) when it contains a sample of his musical handwriting as well. Picasso's payment method of choice was by check: he knew that many payees wouldn't cash it because it bore his signature. The carpenter who built a cabinet at Picasso's request showed shrewdness and wisdom when the only "payment" he asked for his work was that the artist sign the sketch he had just made for the kind of cabinet he wanted. Remainders and reminders of the great can affect and even inspire the devoted. Locks of Beethoven's hair, taken from his deathbed, are kept in glass cases at several museums in Austria, including the Beethoven Memorial Rooms at Mölkerbastei 8 in Vienna. Indeed, a book by Russell Martin, itself titled "Beethoven's Hair," was published by Broadway Books/Random House and deals with the scientific investigations of a lock of the composer's hair, the acquisition of which was made possible by the late Beethoven enthusiast and philanthropist Ira Brilliant. (Among his myriad other ailments, Beethoven had lead poisoning, it would appear). 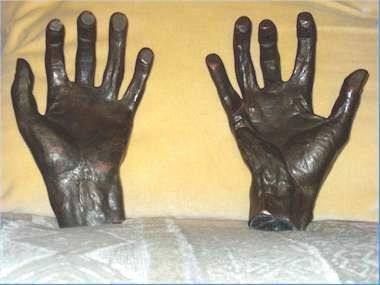 Three of Brahms' inkwells are displayed in as many locations in Austria. Schubert's personal effects are on view at the house in Vienna, at Kettenbrückengasse 6, in which he died in 1828. Mozart's instruments can be seen at the Birthplace Museum in Salzburg, and Liszt's large house on Marienstrasse in Weimar, Germany, is to this very day brimming practically with the man himself -- to such a tangible extent, in fact, that in a figurative sense he still lives there, and the visitor can almost expect this 19th-century counterpart of Leonard Bernstein to enter the salon with a personal greeting. Being pious and having a score of children; wearing threadbare garments and spitting on the floor; growing a long beard and smoking big cigars; and loving music, life and people passionately -- unfortunately none of this will make us one of the four Bs, respectively: Bach, Beethoven, Brahms, or Bernstein. The composers may have accomplished more in a single year than most others do in their individual lifetimes. Although the realm of genius remains largely closed to most of us, if we can't kneel at the altar itself we can still linger respectfully outside the structure of the sanctuary. If we do so with veneration and reverence, it can be a wonderful and even sublime feeling to stand at least before the portals, for the composers whose handwritten manuscripts remain with us lived then, just as we live today. JEFFREY DANE is a researcher, historian, and author whose work has appeared in publications in the USA and abroad, and in several languages. His book, A Composer's Notes -- Remembering Miklós Rózsa was published by iUniverse for the 2007 centenary of the composer's birth. He finds the study of facsimile editions very satisfying, and has a marked tendency to develop an almost emotional attachment to those people, living or not, whose lives and work he studies. He's seen by some as overly confrontational and thusly a real idealist, and by others as insufficiently engaged and thusly an ideal realist. Both views have merit. A number of small illustrations are imbedded within this article, but for convenience we include here the full set of images at full-size. In each case the links will open the corresponding image in a new window or tab.